Knee rehab after an injury can be an intimidating process. This is especially true after knee surgery. Knowing what to expect from your rehab, and what kind of things you should be doing can help set your mind at ease. It will also help you make sure that you are covering all of your bases, and that your athletic trainer or physical therapist is not overlooking any component of the rehab process. Below are the major areas that should be evaluated and addressed with any type of knee rehabilitation. If you are missing one or more of these areas in your current knee rehab program, talk with your AT, PT, or physician to find out why, and to make sure you are doing everything possible for your injury. Improving range of motion is essential during the rehabilitation process. After a knee injury, depending on the severity of the injury and what structures are injured, you may have a little or a lot of range of motion loss. 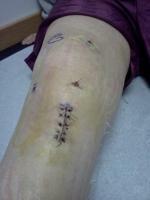 Knee surgeries and injuries to the knee ligaments often cause significant range of motion loss. Overuse injuries like patellar tendonitis and patella femoral syndrome don't usually involve loss of motion, although some motions may be painful. You should be doing some type of exercises to work on improving your knee motion. Towel pulls, heel slides on the floor or the wall, and passive stretching are good exercises to improve flexion. Passive stretching, joint mobilizations, and quadriceps sets can all be done to improve knee extension. Flexibility improvement is a key ingredient for any rehab program. 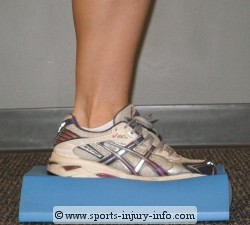 For the knee, good flexibility in the hamstrings, calf, hips, and lower back are essential for normal function. Your rehabilitation should include some type of exercise that helps to improve your flexibility and mobility. Make sure that hip and lower back mobility, as well as ankle mobility is not overlooked. Restrictions in these areas can directly affect knee function. Mobility and flexibility go hand in hand with range of motion. Depending on the nature of your injury, you may need to be doing both range of motion exercises and stretching and flexibility work. You may also need manual therapy joint mobilizations to help restore normal function of the knee joint. Strengthening of the knee muscles is important during rehab. Restoring normal quadriceps and hamstring strength is a primary focus. After injury, the inflammatory process often causes inhibition of the quadriceps muscles. Initially in the rehab process, the goal is restore normal activation and contraction of these muscles, and then to build up their strength. This can be accomplished with a lot of different exercises. Some of my favorites are lunges, step ups, squats, standing knee extensions with theraband, and quadraped extensions. The quadriceps and hamstrings work together to stabilize the knee during activities. This means that you should be doing exercises that involve weight bearing positions, and require the muscles to co-contract to stabilize the knee. I prefer more functional exercises like lunges and squats to machine exercises like leg extensions or hamstring curls. Don't forget strengthening of the hips and core. The muscles on the outside of the hip, as well as the lower abdominal muscles must be strong in order to have good knee stability and to prevent injuries like PFS and patellar tendonitis. Remember, all of the muscles of the trunk and lower extremity work together to produce normal function - so don't neglect the hip and core muscles in your knee rehab program. Your knee rehab program should include a variety of balancing activities to help improve your proprioception. Balance exercises help to improve the communication between the joints and muscles, and improve your overall stability. These exercises may be simple like a single leg balance, or more advanced like balancing and playing catch. Improving your balance helps the muscles and joints to work together more efficiently, and cannot be overlooked. In the early stages of rehabilitation, some focus should be placed on improving your gait, or the way you walk. After a knee surgery, you body has to relearn proper walking, and this is sped up by gait training. Heel to toe walking, high knees, retro walking, and fast walking are all gait training exercises that can help eliminate your limp. Once you have been cleared to jog or run, gait exercises can be used to gradually get you back into running, and improve your overall form. Simple exercises to work on improving flexion and extension. Exercises for strengthening of the quadriceps and hamstrings. A variety of hamstring stretches from traditional to functional. A new twist on traditional lunges. Includes multi-directional lunges and additional challenges.